What is dog training, really? 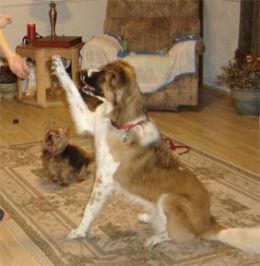 Dog training means practicing a specific, existing behavior and connect with one command. Your dog is generally all you can expect from him: he can sit, run, come to you, chase etc. He just does not know when his master expects of him and what command he/she uses. A dog instructor must make him learn it. What the dog instructor tries to achieve is that the dog understands what behavior we expect and it repeats every time with the command we give. This can be achieved by rewarding your dog every time when he does just behavior. As you are the dog instructor, with scream, push, pull on the leash, or store you only confuse your dog. He is nervous; it will lose confidence in his owner and will be less motivated to learn things. He will not understand why his boss is so busy and angry and what he is doing wrong. Thus the dog training is a prison camp where he will try out just to escape. This way you will achieve very little. In this way, you cannot position yourself higher in the hierarchy. Your dog has been longing that you’re the boss. Unlike punishment, you can achieve positive behavior by rewarding. Every time you reward your dog will reinforce the behavior that he has just showed, and he will increasingly begin to repeat. Your relationship with your dog is getting stronger and your dog wants to work with you and learn more dog treats and pats in the head to get every time he does something right. It is very important that your dog understands what he is commanded. To indicate the time (the timing) of reward is essential. You must pay immediately after giving the correct behavior. If you wait too long the chances are that your dog relates the reward to just what he has done before the reward. What is a good pay? There are no miracle cures. Which dog training method you choose? You should exercise regularly, much to repeat and patience. Put the dog training first on a quiet place so that your dog is free from too much distraction. The session should be short. At first, no more than 3-5 minutes and several times a day. Try to have no long training sessions. Be alert and reward desired behavior every time. From the moment your dog understands the relationship between particular conduct and has established a command that many times you practice and repeat until it is finally learned. Only when your dog has learned a final exercise, you can gradually reduce the reward.